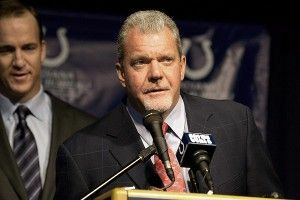 » What Else Does Jim Irsay Need to Change About the Colts? Last week, Colts owner Jim Irsay, unshackled from the intellectual limitations of 140 characters, announced that Peyton Manning and Indy were getting divorced, bringing about, “the conclusion of Peyton’s playing career with the Colts.” This was obviously the big news. But as Colts fans fired up “Holocene” and inserted their DVDs of Super Bowl XLI, Irsay slipped another headline-grabbing statement into the mix: There were even more big changes on the way for the blue and white. “As a franchise, where we are right now with the salary cap, where we are rebuilding, we’re definitely a few years away,” he said. Sure enough, later that week, we learned that the Colts were parting ways with linebacker Gary Brackett, running back Joseph Addai, tight end Dallas Clark, and safety Melvin Bullitt. But I believe it was either Karl Marx or Jim Mora Sr. who said, “Change begets change.” So let’s take a look at what other game-changing innovations could be coming in Indy. Bear in mind that I happen to think Irsay, despite his affinity for social media, is the kind of guy who likes what he likes, and what he likes basically took place between 1985 and 1999. Irsay seems like a guy who never settles for anything but the best in life. So if he’s robbing Colts fans of the most iconic athlete in the franchise’s history, the least he could do is upgrade the on-site snacking. Breathe deep, Andrew Luck. That’s the smell of Steak & Colossal Shrimp. You’re in flavor country. he just seems like the kind of guy who would know where to buy a truckload of Zunes.